Happy Saints: What other Lenten Devotions do you practice? Thanks to our rich Catholic tradition, we are not limited to only praying the Stations of the Cross during Lent. 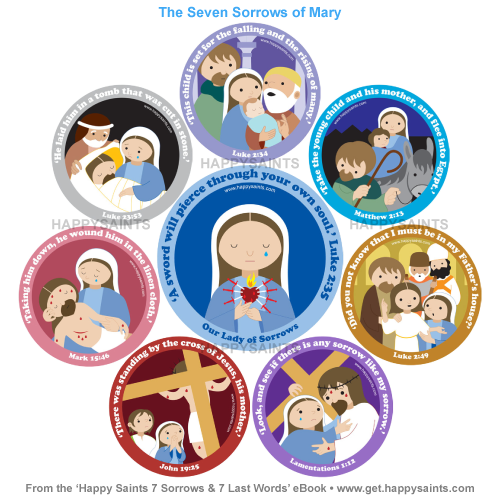 Have you considered meditating on the SEVEN SORROWS OF MARY? By uniting our hearts with Our Lady, we can experience a deep, spiritual encounter this Lent. The ‘Happy Saints 7 Sorrows and 7 Last Words’ eBook is a child-friendly resource that you can use and re-use again for your family, school and parish Lenten activities.